Tell me if this sounds familiar: you’ve eaten out two or three times this week because you couldn’t figure out what to make for dinner. 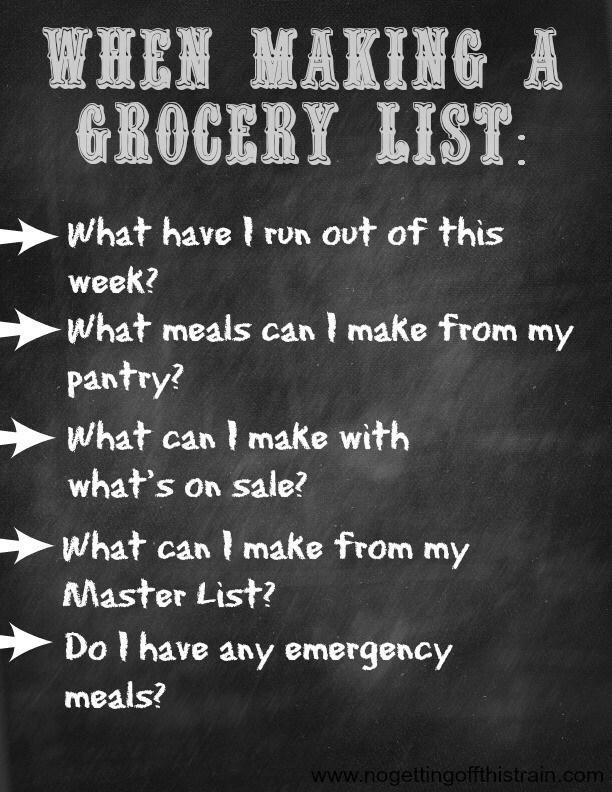 The thought of creating meals for a whole week is daunting and you don’t even know where to begin! Plus, you’re spending too much money on food and want to eat healthier. I’ve been there, starting with the first year of marriage! Meal planning takes practice and doesn’t have to be difficult or fancy. 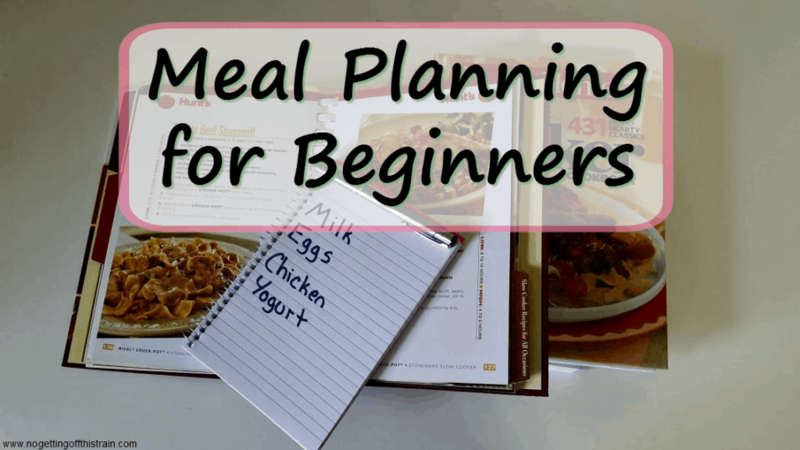 In time, I developed a system of 5 steps that I use every week to create meals- this guide to meal planning for beginners can help save you tons of money and start eating healthier! This is the most important step! If you don’t start out with a budget, you’ll end up spending WAY more than you intended, and may end up throwing out uneaten food. So what’s a good number? That depends on your family’s size and needs! I’ve heard many people say that an average of $25 per person per week is about average. That would mean my family of 3 should spend $75 per week, so we’re right on track! Look at how much you’re already spending. Keep records of your grocery trips for one month and see how much you spend. Do you think it’s too much? Try cutting that number by 10% for the next month to see how you do; it’s a very delicate process, and you have to find that balance! John and I started out our marriage with $50 a week, but after Allison was born we raised it to $60 to help cover formula and other baby food. If you have any special dietary needs, like a diabetic diet, gluten-free, all organic, etc., you may need to allow a little more room in your spending. Every family has at least a few meals they love to eat every month. If you have a list of recipes that you make often, it would be helpful to have all of them in one place to help you choose what to make each week! I’d recommend having at least 30 on your list, if not more, to cover at least a month of meals. Rent cookbooks from the library, get recipes from family/friends, or use my favorite sites, Pinterest and AllRecipes. Pinterest lets you create different board categories so you can keep your recipes organized, and AllRecipes has a recipe box you can send all your favorite recipes to. If you’re having trouble thinking of meals each week, try making each day a themed meal! For example, Monday could be Meatless Mondays, Tuesday could be Taco Tuesdays… you could have breakfast for dinner once a week, make soups and sandwiches one night, or plan one night for leftovers. This seems to work for some people! I personally try to have at least one vegetarian meal per week, one pasta dish, and one Mexican dish, and we do leftovers once a week. What have I run out of this week? If I know I’m out of milk or eggs, these items immediately get put on my list throughout the week as I use them up. This way, I won’t forget to do it later and have an “Oh crap!” moment when I go to make something next week and realize I’m out of eggs. What meals can I make from my pantry? This is why I love having a small stockpile. If I already have basic essentials like canned tomatoes, beans, cheese, etc., I can make simple and cheap meals and may only have to buy one or two items for that meal! If you’re having trouble figuring out what to make with what you have, I recommend Supercook.com. You enter in the ingredients you have and it’ll tell you the recipes you can make! I’ve used this site a couple times and it’s a great way to get ideas. What can I make with what’s on sale this week? The Meijer preview ad comes out on Fridays, and all other ads usually come out on Sundays with the Sunday newspaper. Look through the ads to see what’s cheap that week! Is chicken at a rock-bottom price this week? 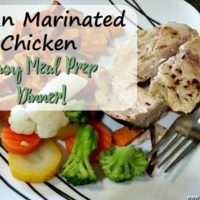 Find a bunch of chicken recipes! Maybe rice is on sale? This week could be a Mexican or Asian inspired recipe week. What can I make from my Master List for the meals I have left? If I still need a couple meals after doing everything above, I’ll then look through my Master List for any favorite recipes we want to have that week, still making sure that we’re under budget. Do I have any emergency “cheap” meals in my pantry/freezer? 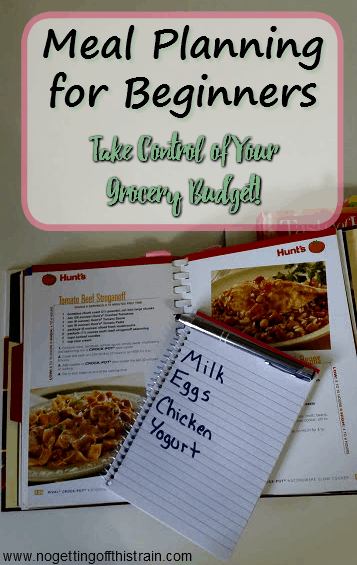 There have been a couple of times that after adding a bunch of essentials to the list that we’ve run out of, there’s suddenly not a lot of money left to buy dinners! “Oh crap, I only have $5.00 and need two more dinners!” In situations like these, we try to keep cheap meals in the freezer like chicken nuggets and fries, or frozen pizza. Sure, it’s not the healthiest, but they’re there in a pinch! If you don’t have any emergency meals but have some extra money in the budget, think about buying one or two meals to stick in the freezer in case you’re low on funds the next week. This is up to you when you plan to do this! I usually start on Thursday afternoons and have it finalized by Friday for our weekend shopping. It might be hard to set aside an entire hour at a time, especially if you work full time or have young kids. Plus, you can always break it up into two separate days, as long as you get it done! If you can’t be consistent, it’s going to be really hard to turn meal planning and budgeting into a habit. Try taking out the amount of cash you need for groceries that week. Using cash tends to keep you in check and it “hurts” more to hand over cash than it does a credit card, because you can physically see the money leaving you. This will probably take awhile to get used to if you’ve never actually done meal planning. It comes easier to some people than others! I’m not perfect either; I have hundreds of recipes at my disposal and I still find myself staring blankly at a screen trying to figure out what to make for the next week. I also tend to go over budget by a few dollars because I forget we’re out of cheese or something! This kind of thing takes a lot of practice, but I promise, your bank account (and your body!) will thank you if you just take the first step towards meal planning! What other tips do you have? Share with us in the comments below! Sharing this with a friend who needs help in this area. Thanks! Great advice! Now I just need to get better about making a realistic budget AND sticking to it! It’s so hard to do at first! I hope you can get a good system going! Just the post that I needed to find! We are in the process of doing meal planning. Thanks so much for all of this wonderful info! Oh nice! Good luck and I’m glad this could help! I swear by meal planning, I am not good at coming up with dinner on the fly when I have three hungry kids at my feet. Great post! Same here! I tend to panic if I ever have nothing scheduled on that day. These are really great tips! Thank you for sharing! I will have to do a better job of trying to make due with what I have in my pantry. It helps me to make a list of what I have in my pantry, both so I don’t buy something when I already have it and so I don’t forget that I really don’t have what I think I do! I totally needed this…I hate cooking and I needed some direction. Thanks. I started meal planning a few weeks ago, and it’s one of the most depressing hours of my week. We live in a high cost of living area, which means even doing everything we can to save money on groceries, we are still going to spend ~$150 a week for two adults. How insane is that? So you can see why it’s depressing! We’ve been eating a lot of meatless meals. I’m saving all my receipts so I can see which store has the lowest prices. I’ve been alternating between Fred Meyer and Safeway. Neither do store coupons, so there’s no way to save that way, and manufacturer’s coupons are almost always still more expensive than just buying store brand, especially when store brand is on sale. I really miss Albertson’s and their “10 for $10” deals. They had way more of them than Safeway. That’s crazy! I really hope you can find a good system that saves you all money. Awesome tips! I swear by meal planning and if I haven’t done it that week, it throws the whole week out of whack and we end up eating frozen pizza and takeout! Great tips! I swear by budgeting and meal planning! Awesome! It saves so much grief the next week. Ooh yes, that’s definitely a sign. =P How awesome. Such great points! I really need to work on meal planning! I just kinda wing it most weeks. I think I would be so much more successful if I planned ahead! It definitely saves us so much money when we plan ahead! Such great tips! I really need to stick to a few of these! Great reminders! These are perfect tips! I love making a meal plan! If I don’t make one then dinner always ends up stressing me out! You have some real talent…great tips! Thanks for joining us on Oh My Heartsie Girl Wordless Wednesday! You’re joking right? $25 per person, per week??? Are you f!&$#% kidding me??? I don’t know what era or fantasy land you are living in but have you noticed that groceries aren’t cheap? Who are you feeding??? MICE??? Hey, that’s just what I read. =) And we’re spending less than that and eating healthy, so we must be doing something right! It also depends on where you live. It varies from state to state, and even country to country. I was talking to someone from Canada who told me there was no way she could spend $60 a week on groceries because everything is so expensive! 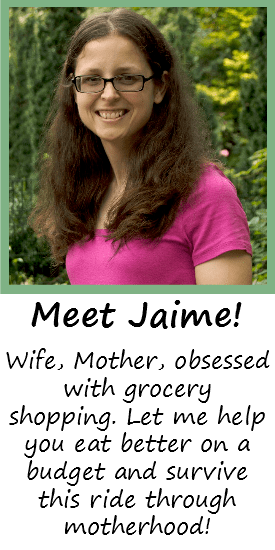 I hope you can find a way to lower your grocery bill! Try looking on Pinterest for “recipes for picky eaters”. I know there are others in the same boat as we are! What I’ve been doing is hiding vegetables in our food for my picky eater. Shredding zucchini in muffins, shredded carrots in pancakes… those little things do help! Good luck! With only two of us it’s hard to not cook too much food then it goes to waste. (we aren’t big on eating leftovers.) I am going to start this meal planning thing and hope this helps with that!! (Fingers crossed)!!!! Good luck! =) We had problems with waste too before we had Allison, even with meal planning. Some recipes just make so much! Thankfully, halving most recipes seems to help.